Bit Tooth Energy: The Precipitation Hypothesis - is it true? Today we test the “Diane Sawyer” hypothesis. 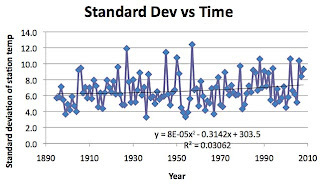 The hypothesis we are testing is that global warming has led to an increase in precipitation. I’d call it rain for short, but Ms Sawyer made the remark at the end of an ABC newscast the other day about snow. Namely she stated that we should not think, because we have more snow that Global Warming is not happening. In fact, she went on to say words to the effect that because the Earth is getting warmer this causes more precipitation, which, at the time was what Washington was seeing, and that this has been predicted. Well that is pretty definitive, and so let us, using the same procedure as last week, see if in fact this hypothesis is true. 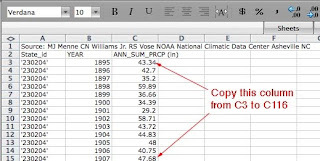 And, to make my life (and yours if you are following along) easier I am going to use the structure of the spreadsheet that I created last week, and merely, where possible, replace the temperature data with annual precipitation data from the same set of weather stations. To get the precipitation information I step through the same sequence from the United States Historical Climatology Network to get to the station sites for Missouri, which if you will remember, gets me to this map. As before I will step down through the list of weather stations that are given for the state to get the data that I need. After clicking on the name of the station (and again I will use Appleton City as the example) I already have the station data entered from last time, so all I need to do is click on the “Get Monthly Data” phrase. And when you click the blue line, then a file is downloaded to your computer. As before if you open the file, then you get the list of annual precipitation for the site since 1895. Returning to the spreadsheet with all the stations on it, I now paste that column of data into the table, starting in square C13. As before I continue doing this, until I have all the precipitation data from the USHCN weather stations (all 26). 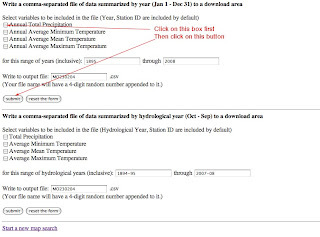 In contrast with the temperature data I don’t know where to go to get the precipitation data for Missouri from GISS – a visit to their site notes that they get their information from the Climate Research Unit at the University of East Anglia – and given the current kerfuffle over there, I am going to give trying to get info from them a pass. 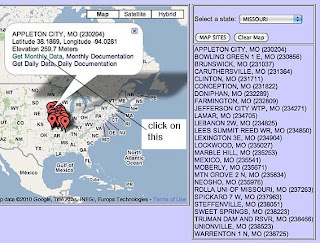 Still we have the information from the last 114 years for Missouri, based on 26 stations. I already have the average for those stations set up from when I created the original spreadsheet (though I have to change the data ranges for the plots). And now I can check the hypothesis that we started with. Given the reported increase in global temperature, has there been an increase in precipitation in Missouri? Well if one looks there has been a very small, and statistically insignificant, increase in precipitation over the last 114 years, so it appears that the Diane Sawyer hypothesis is incorrect. Well there is a trend, if not a very significant one, which gives a little scientific credence to Anthony Watts for the state of Missouri. And does population size have an impact? I was going to leave that without comment, but I suspect that the apparent correlation has more to do with where folk live in regard to latitude, than the actual size of the population, but to validate the relationship would require a lot more data than I have input to date. Now you may say that what I have posted today really has little relevance, since Missouri has had an insignificant amount of warming over the past 114 years but the moisture that Missouri sees (and feels in the rain and snow) is largely generated elsewhere, and so if there is a correlation, given the relatively large amount of precipitation the state gets, then it should show up, or should it? 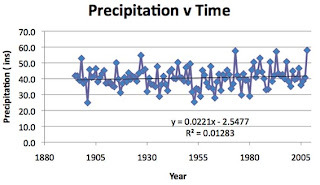 Globally-averaged land-based precipitation shows a statistically insignificant upward trend with most of the increase occurring in the first half of the 20th century. So I am afraid it is not just Missouri data but also global data that falsifies the “Sawyer” hypothesis.